The EMMS non-invasive airway mechanics system uses a classic Pennock style double-chamber plethysmograph to measure nasal and thoracic flow. The animal is placed in a double-chamber plethysmograph (eg. PLY 230 for guinea pig), and is restrained in the chamber with a rubber neck collar. This neck collar also provides an airtight seal between the thoracic and nasal chambers. Flow in the two chambers is measured across two pneumotachographs in the plethysmograph wall. 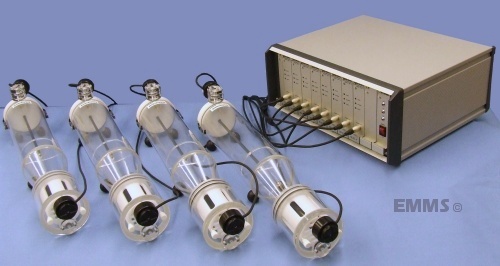 A bias flow air supply is used to prevent build-up of CO2 in the plethysmograph, and may also be used to pull aerosol through the nasal chamber. 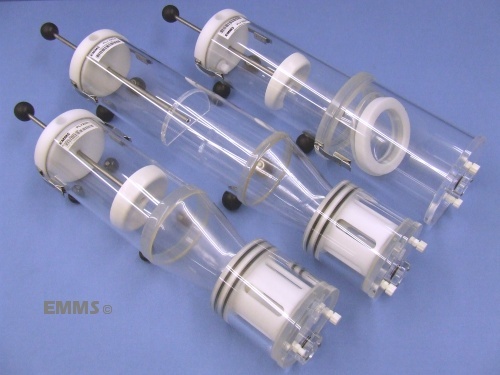 EMMS Double Chamber Plethysmographs in Conical and Sloped Front configuration.